(MAHWAH, N.J.) – August 10, 2014 - Capable of accelerating from 0-60 mph in 4.5 seconds with an electronically limited top track speed of 162 mph, the Range Rover Sport SVR will be the first Land Rover vehicle to wear the new high-performance SVR badge. Producing a lap time of 8 minutes 14 seconds on Germany's legendary Nürburgring Nordschleife racetrack, the Range Rover Sport SVR unleashes the full potential of the lightweight and robust all-aluminum architecture, while retaining refinement, luxury and off-road capability. Speaking ahead of its global premiere, John Edwards, Managing Director of Land Rover Special Operations, said: "The Range Rover Sport SVR is a natural progression beyond the core vehicle's outstanding on- and off-road capabilities and leading-edge design. It's exhilarating performance will satisfy a particularly demanding customer set." "A thorough range of revisions specially developed by Land Rover's Special Vehicle Operations combine to make this premium derivative even more distinctive both inside and out, as well as taking its dynamic capabilities to the next level without impacting on comfort, refinement or all-terrain versatility. The Range Rover Sport SVR is truly the world's most capable performance SUV." The engine's advanced and highly efficient design characteristics include: low internal friction; high-pressure direct injection with a centrally mounted, multi-hole, spray-guided injection system; dual independent variable camshaft timing (VCT); and an advanced intelligent Stop/Start system that stops the engine instead of idling and instantly restarts it when the driver is read to proceed. The transmission's adaptive shift strategy monitors acceleration and brake inputs, lateral cornering forces, kickdown requests and even the severity of gradients, before choosing one of 25 pre-determined programs to seamlessly adapt to driver behavior and road conditions. Sportier driving triggers more aggressive gearshifts and defers upshifts. Despite this performance focus, there is no impact on refinement: the ZF eight-speed transmission's torque converter operates for smooth take off in first gear, but is bypassed by a locking clutch from second gear. This creates a direct link between the transmission and the driven wheels. The transfer case offers selectable low- and high-range, using a two-speed fully synchronized shift on the move' system which allows the driver to change between the two at up to 37 mph for exceptional flexibility. High-range provides a direct drive ratio of 1:1, while the low-range ratio is 2.93:1, providing an extremely low crawl speed. This allows for an overall crawl ratio of 45.542:1. Torque Vectoring is also uniquely recalibrated. It uses the car's brake system to create the effect of a torque-vectoring differential, constantly balancing the distribution of engine torque between the four wheels during cornering, for improved grip and steering, and reduced understeer2. The exterior design and luxurious interior of Land Rover's premium sports SUV have been enhanced for the Range Rover Sport SVR with a range of dynamic improvements. Designed exclusively by Jaguar Land Rover's Special Vehicle Operations (SVO), the Range Rover Sport SVR makes a strong visual statement. These include a front bumper with muscular trapezoidal air intakes, dark Range Rover script on the clamshell hood, which also features revised vents, and a new grille in a dark finish that contrasts with the headlights' LED signature lighting. At the side of the vehicle, an all-new fender incorporates a distinctively designed vent, while unique side moldings add muscularity. At the rear, prominent Range Rover Sport SVR badging and a pronounced high-level spoiler with a centrally mounted brake light signal the vehicle's sporting intent. The unique rear bumper features a gloss black diffuser, which incorporates unique quad exhaust pipes, instantly differentiating this high-performance derivative. The new rear spoiler reduces lift, and has been carefully balanced with the new front bumper. Beneath the front bumper a new NVH comb is fitted, which reduces wind noise and improves aerodynamic efficiency. It also reduces front-end lift to help the front tires retain high levels of grip during enthusiastic driving. The deeper front bumper's more aggressive lower section can also be removed for extreme off-roading. Inside, Jaguar Land Rover's Special Vehicle Operations has differentiated the SVR with distinctive leather sports seats. These comfortable seats offer additional lateral support during spirited driving. Full 16-way electric adjustment is offered and the vehicle's Sports Command Driving Position and generous rear legroom are unaffected. "The Range Rover Sport SVR is the ultimate in premium performance," said Land Rover Design Director and Chief Creative Officer, Gerry McGovern. "Crafted by Land Rover's 'Special Vehicle Operations', its performance-focused design revisions clearly differentiate the most powerful Land Rover vehicle ever produced from existing derivatives with its ground-hugging, assertive stance and additional road presence. This striking evolution retains the trademark DNA for which the Range Rover Sport is so widely acclaimed." While offering a level of performance normally associated with performance cars, the vehicle's high levels of comfort and off-road capability have not been sacrificed: the ride quality retains its compliance and the ride height is unaltered, with an adjustable range from 2 inches (50mm) in access mode up to 9.3-inches (235mm) for off-roading. Wheel travel also remains identical, with 10.2-inches of movement at the front and 10.7-inches (272mm) at the rear. Wading depth continues to be 33.5-inches (850mm). Six Terrain Response® 2 settings continue to be available: General, Dynamic, Grass/Gravel/Snow, Mud/Ruts, Sand, and Rock Crawl. Alternatively, the "Auto" setting intelligently selects the most appropriate mode. 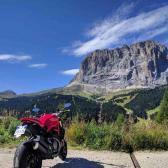 Si chiama SVR (e tale sigla andrà a definire le future LR e - a quanto pare Jag - sportive), ha 550Cv. Queste sono le cose che mi mandano in bestia: ufficializzare un mulo che abbiamo già visto andar su e giù per il 'Ring per svariati mesi. Finalmente l'hanno ufficializzato come si deve! Che ve ne pare? Magnifico questo blu, esclusivo per questa SVR! Mi lasciano un po' perplesso i sedili sportivi posteriori, secondo me non c'era bisogno di farli così. Immagino le bestemmie per il guidatore in manovra o se deve guardare dietro nel retrovisore. Quanto sono tamarri quei sedili posteriori?